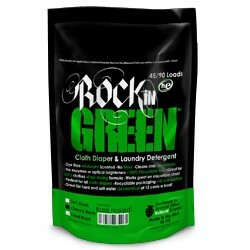 Then Rockin' Green should be on your cloth diaper playlist! It comes in 3 rockin' formulas and tons of sweet fragrances, which is music to anyone's ears. Available in these awesome scents: Smashing Watermelons, Bare Naked Babies (unscented), Mötley Cleän, Earth Wind and Orchid, Lavender Mint Revival. Call or Email to find out if we have your scent in stock!